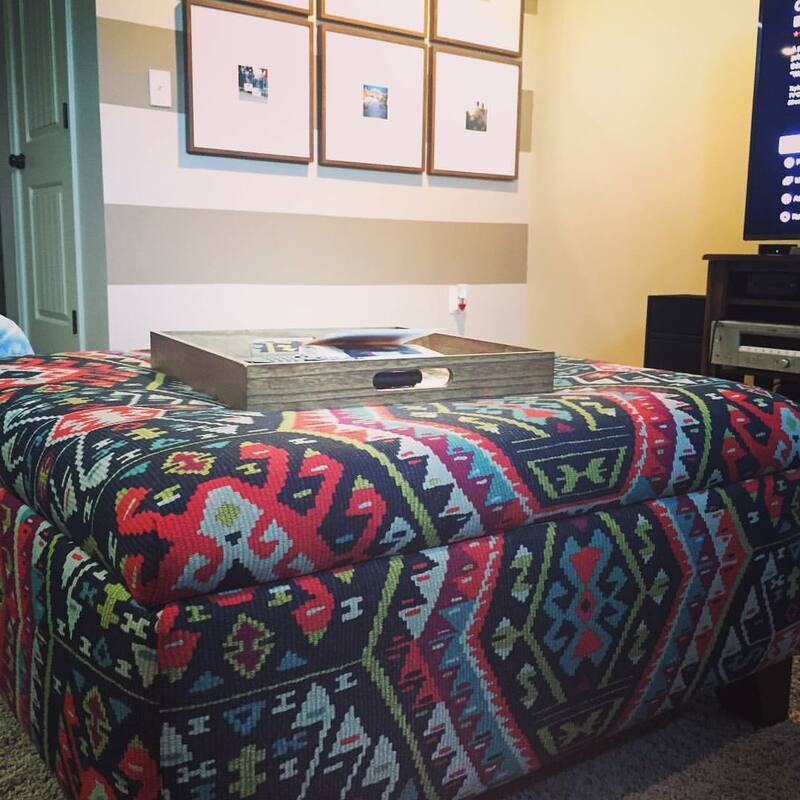 Maybe 5 years or so ago we got a new ottoman--it wasn't the prettiest thing but we weren't going for style, we were going for two things, functionality and most importantly, not subjecting our children to injury. 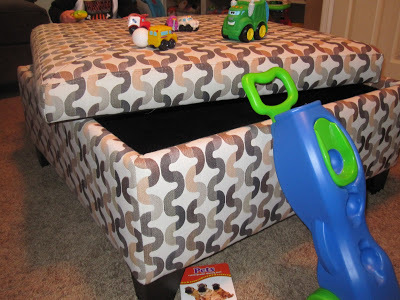 We failed on the first attempt at coffee tables and Kaden took the brunt of it, so this time around we looked passed the horrible fabric and went with what we needed. When we purchased our current home we had more space and eventually the couch and the ottoman found their way to the basement as new furniture found it's way into our home. And after 5 years, it has really started to show some wear and tear. Not to mention, the fabric was still atrocious. But the functionality keeps me from kicking it to the curb--don't get me wrong, I've tried and Justin just keeps pulling it back in. Since we have started spending more time in the basement this winter and have started hanging a few things on the walls--a gallery wall down World Series memory lane, a 2014 & 2015 Royals WS autographed team jerseys--it was time to do something about that damn eyesore. I called the upholstery guy we use and gave him the dimensions and he gave me the price, or what he thought would be the price without seeing it--$75 or $80. WHAT? You are totally jacking with me right? I've been waiting this long for $75 bucks?!? Well, now at least you know, there is no reason to wait if you're considering a similar project. I immediately started searching for fabric. Looked at LS Fabric -- purchased the fabric for Logan's rocking chair from here but no luck this time around. Went to Pinterest, pinned and scrolled for a few minutes and then ran across this print from Tonic Living. I was worried it might be a little too busy so I copied the link and added a few other possibilities to it and sent it to my friend, Sarah. She's has an eye like no one else I know. Out of the links, she picked the same one, so I added it to my cart and a few days later it was in our mailbox. Now, I haven't necessarily showed Justin and mainly because I was about 90% sure he wouldn't like the print of the fabric BUT he is also the kind of person that has a hard time envisioning what something will look like before it is actually done. This way I don't get bummed because he doesn't like it and he doesn't think, "what the hell is she thinking---she wants PINK to be the accent color?". It really is a win, win. So I dropped it off. I purchased an extra yard of fabric in hopes they could make a couple pillow cases for me to add to the couch, you know, tie it all together. Then came the wait. & I waited. & I got more anxious by the day. Finally, I got the call & I picked it up. & it was GORGEOUS. It ended up being a little more than they originally quoted me because they relined the inside but I was perfectly fine with shelling out the extra for the outcome. Why oh why did I wait so long.